Medals awarded to former McMaster President Henry G. Thode (1910-1997) are part of a special exhibit on display in Thode Library that sheds light on the extraordinary accomplishments of one of Canada’s most celebrated scientists. He was an internationally-renowned scientist, a pioneer in harnessing atomic energy for peaceful purposes, and one of McMaster’s most visionary leaders. 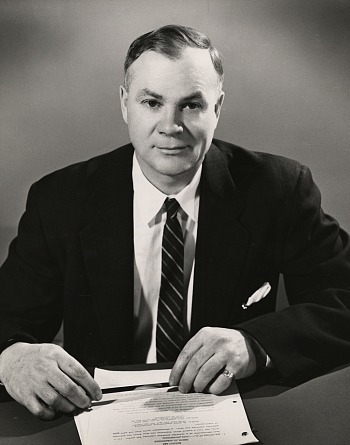 Now, medals awarded to former McMaster President Henry G. Thode (1910-1997) are part of a special exhibit that sheds light on the extraordinary accomplishments of one of Canada’s most celebrated scientists. World-renowned researcher and McMaster President from 1962-1972 Henry G. Thode. Photo taken in 1957. 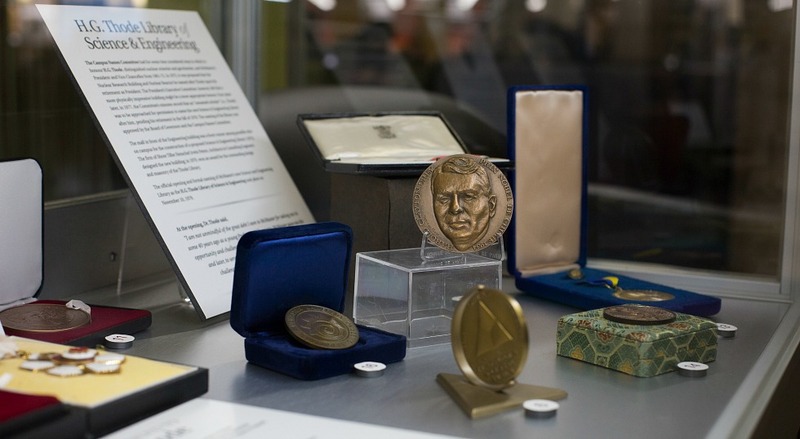 The exhibit, now on display in McMaster’s H.G Thode Library of Science and Engineering, showcases 16 of the many medals awarded to Thode throughout his distinguished life and career. Thode was recognized globally as a leading geochemist and nuclear scientist whose work spanned a number of scientific disciplines. But to those that knew him personally, he was also a modest and unassuming man with a deep love of knowledge who, as both a farmer and a musician, had many interests and abilities that extended well beyond his work as a researcher and administrator. He designed and constructed Canada’s first mass spectrometer – an instrument that measures isotopes and produces fissionable materials for use in nuclear reactors. During World War II, while on a leave of absence from McMaster, he was a pivotal member of the Atomic Energy Project of the National Research Council in Montreal, conducting research that would later be instrumental in the development of the CANDU reactor and Canada’s nuclear energy industry. Recognizing the potential of radioisotopes for use in medicine, Thode helped establish a medical research department at McMaster where he, along with Charles Jaimet, investigated the use of radioactive iodine in the diagnosis and treatment of thyroid disease, the first medical application of radioactive iodine in Canada. Thode’s later isotope research focused on the geological history of the Earth and the solar system. He was one of only two Canadians to obtain rock samples from the lunar landing in 1969, studying the samples to understand the origins and geological structure of the moon. Over his career, which spanned six decades, Thode was honoured by governments and scientific societies around the world, including in China, Germany, Britain, and the United States. He was made a member of the Order of the British Empire for his wartime contributions to atomic research. He also received the prestigious Arthur L. Day Award from the Geological Society of America. in 1943, at the age of 33, he was named a Fellow of the Royal Society of Canada and in 1967, he became one of the first scientists to be made a Companion of the Order of Canada. All these medals are contained in the display. Thode first came to McMaster as an associate professor of chemistry in 1939, and held many key roles at the university including director of research and head of the Department of Chemistry from 1948-1952. He was the principal of Hamilton College (an affiliated college dedicated to science) from 1949-1957. He was named vice-president of McMaster in 1957 and served as president and vice-chancellor from 1961-1972. In 1973, he received an honorary degree from McMaster. He oversaw an unprecedented era of expansion at the university which included the construction of the McMaster Nuclear Reactor, the McMaster Health Sciences Centre, the Engineering building (now the John Hodgins Engineering Building), the Senior Sciences Building (now AN Bourns Science Building), the Arts complex, as well as the founding of McMaster’s world-renowned medical school. McMaster’s H.G Thode Library of Science and Engineering was named in his honour in 1978. The medals came to McMaster from the estate of Henry Thode through his son, Patrick Thode. They are part of the Henry G. Thode archive, which is housed in McMaster University Library’s William Ready Division of Archives and Research Collections.